Home Sports Pope picks The worlds best footballer!!! Pope picks The worlds best footballer!!! 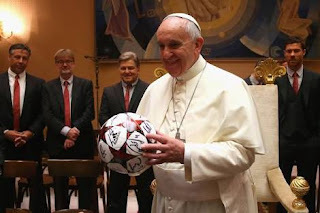 Catholic Pontiff, Pope Francis has revealed the footballer he thinks is the greatest of not only our time but of all times. When asked, he said fellow Argentinian Lionel Messi is the best player in football history. For me, [Lionel] Messi is better than Maradona and Pele. Well known for his support for Argentinian club San Lorenzo, the Pope picked Messi over Diego Maradona and Pele. Given his long history of love for the sport and his professed fanatism, Pope Francis’ words hold a certain weight.